This is a first. Budweiser has released its Super Bowl commercial prior to the game. Or maybe they’re just throwing us a red herring, and they’ll have another commercial on game day. (In fact, I just checked and Anheuser-Busch will have 4 1/2 minutes of ads during the game, so more to come). Either way, this ad made me weep a little (all of the Budweiser commercials do, which is pretty good for a beer ad). The commercial, titled “The Clydesdales: Brotherhood,” was released this week to coincide with a new Twitter account: @Budweiser (Budweiser hasn’t been on Twitter all this time?). According to a press release, the Budweiser Clydesdales have appeared in 23 Super Bowl spots since 1986, and this is the first time Budweiser is releasing its Super Bowl spot early. 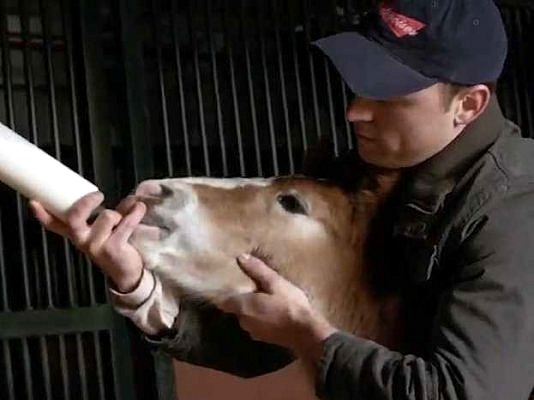 The ad follows the birth of a young Clydesdale as he bonds with his trainer, played by Don Jeanes, who played Neil Armstrong in the movie “Transformers.” On Twitter, Budweiser is asking fans to help name the baby Clydesdale using the hashtag #clydesdales. Really enjoyed the commercial for Budweiser “Brotherhood”….Clydesdales are a class of their own…..
Budweiser always seems to get it just right. Just the right blend of sentiment and story.